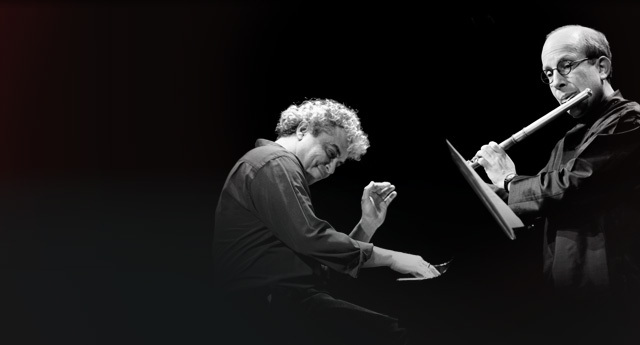 On Saturday, March 12, flutist Paul Taub and pianist/composer Jovino Santos Neto will present an evening of Brazilian music featuring the compositions of the heralded and influential Brazilian composer, pianist and flutist Hermeto Pascoal. Also on the program will be music by Santos Neto himself as well as repertoire by other Brazilian composers such as Pixinguinha and Antonio Carlos Jobim, spanning a variety of styles influenced by jazz and classical music. Originally from Rio de Janeiro, Brazil, Seattle based pianist, flutist and composer Jovino Santos Neto continues to blur the boundaries between classical music, jazz, and indigenous Brazilian music. A member of Hermeto Pascoal’s legendary band from 1977 to 1992, three-time Latin Grammy nominee Santos Neto has built a solid reputation as a creative and inspired musician, producer and arranger. New York-born Paul Taub plays an active role in the Seattle contemporary music scene as a soloist and flutist of the Seattle Chamber Players and IWO Flute Quartet. With a background in classical music, his interest and repertoire encompasses styles from the Baroque to the Avant-garde. Taub and Santos Neto have collaborated frequently as colleagues on the faculty of Cornish College of the Arts in Seattle and have performed in venues from San Francisco to the Pacific Northwest. This program features highlights of their work together in a sampling of music by Hermeto Pascoal and Brazilian composers who both influenced and have been inspired by him. This concert is a benefit for the Tom Zbyszewski Memorial Scholarship fund at the Methow Valley Education Foundation. Both Jovino and Paul have personal and musical connections to the Methow Valley from performances and collaborations here in the past, and are generously donating their talents for this event. DATE: Saturday, March 12, 7pm. LOCATION: The Merc Playhouse, Twisp. TICKETS: By donation. CONTACT/INFO: Lynette Westendorf, 509.996.3418.